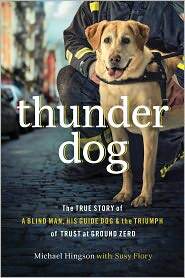 Thunder Dog is the story of how one man and his guide dog worked together as they evacuated the World Trade Center on September 11. Michael Hingson and Roselle's story is one of courage, determination and survival. It is not only their story but also one of how they helped those around them. This book made me cry one moment and laugh the next. It is an inspiring story of a trusting, loving relationship between dog, man and God.The book opens with the circumstances surrounding Michael's premature birth and resulting blindness. Continuing through his years growing up in a supportive family who allowed Michael to take risks to live as mainstream as possible, we not only marvel at Michael's courage on 9/11, but how his whole life has portrayed this same courage. The fact that he was working as a successful businessman in the towers is a story in itself. I prefer dogs to most people and find animals to be way better examples of how to live. This book was inspirational. It's the biographical account of a man who worked in the World Trade Center during September 11th. He is a blind businessman and that day had his Seeing Eye dog with him at work. It's still hard for me to wrap my brain around the events of that day. I can't even imagine being blind in the middle of all that. He tells the story of making it out alive and how his life is changed forever. The dedication of his dog is inspiring. His determination will make you want to be a better person. And by the time you turn the last page you'll remember you have no reason to complain. I recieved this book free from booksneeze.com Where bloggers get free books in exchange for their reviews.